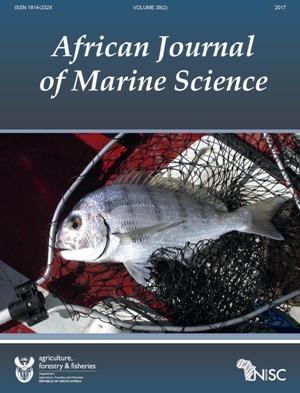 African Journal of Marine Science, Issue 2, Volume 39 includes an article published by Dr. D. Parker et al., documenting that catches of white stumpnose Rhabdosargus globiceps have decreased significantly in recent years under mounting fishing pressure. The article, titled, “When plenty is not enough: an assessment of the white stumpnose (Rhabdosargus globiceps) fishery of Saldanha Bay, South Africa” furthermore details that industrial development in the bay has degraded habitat essential to the survival of juvenile white stumpnose, impeding recruitment and compounding the local stock depletion. The once-plentiful white stumpnose is thought to have contributed significantly to the local economy, particularly through tourism, and the socioeconomic implications of this iconic species’ decline are unknown. “The picturesque small town of Saldanha, on the shores of Saldanha Bay on the west coast of South Africa, has a history that has largely been defined by the fisheries on which much of the local community depend,” documents Dr. D. Parker in the cover photograph’s caption. Some of those fisheries are located within the bay itself, where cold, nutrient-rich waters from the West Coast are warmed substantially by the adjacent, shallow Langebaan Lagoon, creating a sub-tropical refuge for many fish and tourists alike. The bay supports an abundant and diverse fish fauna and for centuries this unique and exceptionally productive ecosystem provided bountiful catches to residents and visitors. Today, commercial linefishers, recreational anglers and subsistence fishers all vie for the dwindling fish stocks within the bay. The authors conclude that a decisive managerial intervention is now required to avoid a collapse in the white stumpnose fishery of Saldanha Bay. They have also recommended that the viability of the maintainance of the the Saldanha Bay commercial fishery for white stumpnose be assessed, including changing the bag limits and increasing the minimum size limit to 30cm TL. This article can be read at no cost until the end of October 2017 here.